Gordon is unique. 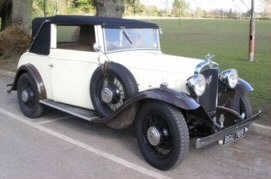 It has a special coach-built body by Gordon of Sparkbrook Road, Birmingham. 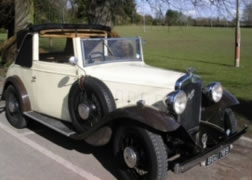 As far as I can tell, this is the only body of this style built on an Austin 16/6 chassis. It has a really smooth and powerful 2 1/4 litre engine that effortlessly propels the car along in style. The 3 position hood can be fully lowered, can be raised at the back and open at the front to give protection but plenty of air and ventilation or can be completely closed with the windows wound up to be like a saloon car. 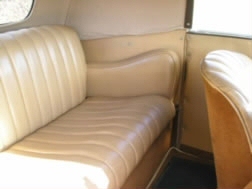 The car gives a smooth, quiet and comfortable ride. The running boards allow easy access. 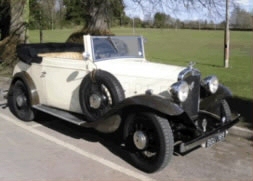 It is a deceptively large and imposing car with the side-mounted spare wheel, its large chrome radiator and lights. A unique and impressive car that will bring style to your wedding day. “A brief thank you from ourselves, brides parents, and bride and groom. Punctual ,efficient, courteous and above all so helpful are words aptly describing the assistance of our chauffeur throughout the day.